Apple turn 35 years old today, April 1, 2011. Established on April 1, 1976 in Cupertino, California, and incorporated on January 3, 1977, the company was previously named Apple Computer, Inc., for its first 30 years, but removed the word "Computer" on January 9, 2007, to reflect the company's ongoing expansion into the consumer electronics market in addition to its traditional focus on personal computers. As of September 2010, Apple had 46,600 full time employees and 2,800 temporary full time employees worldwide and had worldwide annual sales of $65.23 billion. Ronald Gerald Wayne help founded Apple Computer with Steve Jobs and Steve Wozniak, but soon gave up his share of the new company for a total of $2,300. You can read the Wikipedia brief on Ron Wayne. I mentioned him because he is often now known by most people. The company is best-known hardware products include the Macintosh line of computers, the iPod, the iPhone and the iPad. Apple software includes the Mac OS X operating system; the iTunes media browser; the iLife suite of multimedia and creativity software; the iWork suite of productivity software; Aperture, a professional photography package; Final Cut Studio, a suite of professional audio and film-industry software products; Logic Studio, a suite of music production tools; the Safari internet browser; and iOS, a mobile operating system. As of August 2010, the company operates 301 retail stores in ten countries, and an online store where hardware and software products are sold. As of May 2010, Apple is one of the largest companies in the world and the most valuable technology company in the world, having surpassed Microsoft. It wasn't always peaches and creams. In 1985 John Sculley, the former Pepsi president, took the role of CEO at Apple and won board approval to oust Steve Jobs after after power struggle between them escalated. MacWorld UK has an interesting story about Apple: Apple is 35 that is worth a read. In 1985, tensions between Sculley and Jobs about the direction of the company culminated in Jobs trying to oust Sculley in a palace coup. It failed, and Sculley stripped the founder of all his operational responsibilities. By September, Jobs was gone. Litigation ensued when Jobs tried to take some employees with him. Jobs sold his Apple stock. Bloodied but not beaten, Jobs recovered from the very high-profile exit. Certainly, founders losing control of their creation is a common and painful endgame in American business. Jobs talked about how he thought about fleeing the valley because of his very public failure, but he slowly realized he still loved what he did. He decided to start over. Jobs started NeXT Computer Inc., which failed in its attempt to sell elegant, expensive black computers to the business market, and by 1993, shifted its focus to the sale and development of its Nextstep operating system (which would evolve into Mac OS X). In 1986, however, Jobs stepped deeply into the entertainment world when he purchased the Pixar computer animation studios from George Lucas for less than $10 million, and then immersed himself in this new work. In 1991, Pixar and Disney agreed to form a filmmaking partnership under which Pixar made the movies and Disney distributed them. During Job's absence, Apple experimented with a number of other failed consumer targeted products including digital cameras, portable CD audio players, speakers, video consoles, and TV appliances. Enormous resources were also invested in the problem-plagued Newton division based on John Sculley's unrealistic market forecasts. Apple sued Microsoft for using a graphical user interface similar to the Apple Lisa in Apple Computer, Inc. v. Microsoft Corporation. The lawsuit dragged on for years before it was finally dismissed. At the same time, a series of major product flops and missed deadlines sullied Apple's reputation, and Sculley was replaced by Michael Spindler. In 1996, Michael Spindler was replaced by Gil Amelio as CEO. Gil Amelio made many changes at Apple, including massive layoffs. After multiple failed attempts to improve Mac OS, first with the Taligent project, then later with Copland and Gershwin, Amelio chose to purchase NeXT and its NeXTSTEP operating system, bringing Steve Jobs back to Apple as an advisor. On July 9, 1997, Gil Amelio was ousted by the board of directors after crippling financial losses. 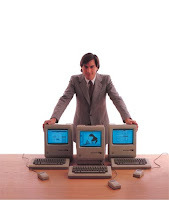 Jobs became the interim CEO and began restructuring the company's product line. Once Steve came back into the driving seat of Apple, they have had a must rosier outlook. Apple's success during this period was evident in its stock price. Between early 2003 and 2006, the price of Apple's stock increased more than tenfold, from around $6 per share (split-adjusted) to over $80. In January 2006, Apple's market cap surpassed that of Dell. Nine years prior, Dell's CEO Michael Dell said that if he ran Apple he would "shut it down and give the money back to the shareholders. Good thing Dell wasn't running the ship. In October 2010, Apple shares hit an all-time high, eclipsing $300. Additionally, on October 20, Apple updated their MacBook Air laptop, iLife suite of applications, and unveiled Mac OS X Lion, the latest installment in their Mac OS X operating system. On January 6, 2011, the company opened their Mac App Store, a digital software distribution platform, similar to the existing iOS App Store. The iPad and iPad 2 has helped to boost Apple's awareness beyond the geeks and loyal followers to the regular folk, would don't know or care who makes it or even how it even works. They just love that it works and work beautifully. With this new following, the success of the iPad, the speculative release of new the iOS 5 and the iPhone 5, a record-breaking "sell out" for their Worldwide Developer's Conference scheduled for June 2011 and a present stock price of around $350 a share - Apple is surely having a awesome birthday. Apple plans to conduct a conference call to discuss financial results of its second fiscal quarter on Wednesday, April 20, 2011 at 2:00 p.m PT. I bet you an iPad 2 that they made a fleet full of money during the reporting quarter too.